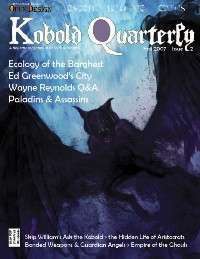 Kobold Quarterlyis the scrappy little magazine of Open Design, a tiny journal that covers the world's premiere roleplaying game from the gamer's perspective. The second issue includes articles by Ed Greenwood, Nicolas Logue, Skip Williams, Wolfgang Baur, and Jeff Grubb, among others. It features full-color art by fantasy artists new and familiar. Kobold Quarterly gives you player options, the finest design techniques, great interviews, cartoons, and tested tactical crunch. Aaron Acevedo, Wayne Reynolds, Stan! This title was added to our catalog on October 04, 2007.